In 2016, the worldwide watch industry has created and filed a substantial number of innovations in mechanical watches, exterior parts, as well as electronic and connected components. The actors in these fields are as numerous as the topics of invention. Therefore, it is very difficult for those industry players observing the sector to keep an overview of what is going on and to deduce a compelling strategic vision. In order to support the endeavor of keeping an overview of the innovation and technology activities worldwide, the Swiss Center For Data Analysis (CENTREDOC) publishes, for the second time, a Global Watch Innovation And Technology Review (Patent Landscape). This report covers the inventions published in the following coutries: Germany, France, the UK, Switzerland, USA, and via the European Patent Office (EPO) and World Intellectual Property Office (WIPO). The 2017 Edition of the Global Watch Innovation And Technology Review highlights the following facts about inventions and new products and processes in the watch industry. 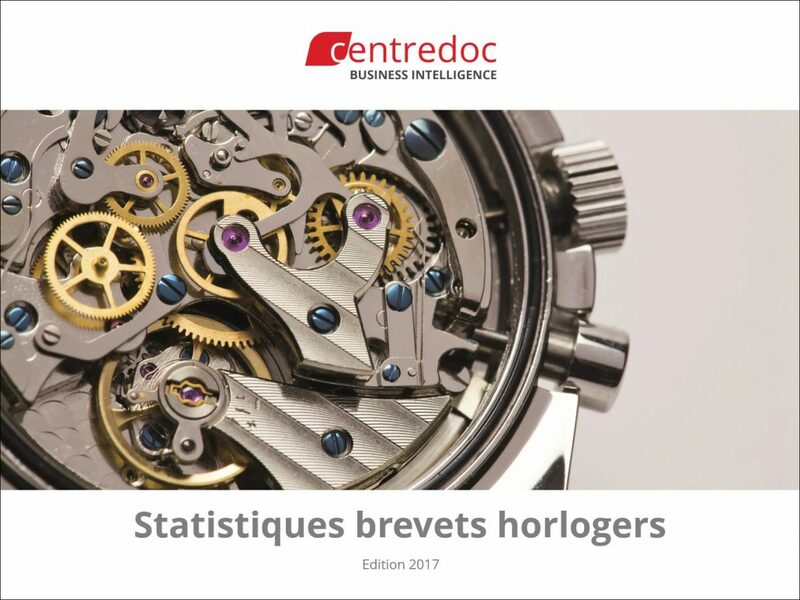 In 2016, a total number of 1’032 new patent applications have been filed in the field of horology in the analysed countries (Germany, France, the UK, Switzerland, the USA, EPO and WIPO), representing a 16% increase with respect to 2015. This figure relates to classical (mechanical and electronical) watches without considering connected watches. In 2016, the Swatch Group is the company with the biggest number of patent applications (243 documents), ahead of Seiko Epson with 75 published patents and Samsung with 57 published patents. The Swatch Group mainly protected innovations for mechanical watches (50% of all its patent filings in 2016) as well as innovations in the field of exterior parts. Across all actors, the electronic watch is the main subject of watch patent filing in 2016 with 31% of the published inventions belonging to this category, followed by the exterior parts with 27% and the mechanical watches with 24%. Inside the category of electronic watches, the biggest number of documents relates to input/output devices. Overall, 428 patents have been filed with regards to electronic watches, the biggest actor being Samsung. Apple, Samsung, LG or Google, these are some of the names the watch industry was not used to see in its field until recently. However, these companies position themselves henceforth amid the high end in the ranking of the community of watch patent filings. Samsung is at the 3rd place with 57 published patents in 2016, LG is 4th (46 patents), Apple is No 6 (32 patents) and Google is No 9 with 14 patents. Without considering the technologies related to connected watches (which are one domain of electronic), and considering only the areas related to so called “classical” watch making, Switzerland is at the top of the origin of innovation. This country is in fact the principal source of patents published in this field in 2016 in the covered countries, before the USA, Japan and South Korea (Asian patents are not covered by the study but asian countries applied for occidental patents, explaining the presence of Japan and Korea in this ranking). Switzerland is particularly strong in the domain of exterior parts and mechanical watches. 3 of the 10 principal applicants are working out of Switzerland (Swatch Group, Richemont, and Rolex).